Performance Time: Approximately 30 minutes, 27 pgs. CHILDREN’S COMEDY. Mother Goose throws a birthday party for the Big Bad Wolf and all the big names in the fairytale world show up: Little Red Riding Hood, Goldilocks, Humpty Dumpty, Jack and Jill, Little Bo Peep, Snow White and three dwarves, Rapunzel, the Three Pigs, a witch, and even a frog prince. 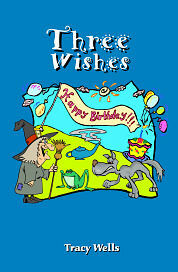 When Aladdin arrives with his genie, he gives the Big Bad Wolf three wishes for his birthday, and the Big Bad Wolf wishes that all the partygoers get to make one wish. Even though Mother Goose warns everyone to be careful what they wish for, no one heeds her advice and the party soon becomes a party to remember for its craziness, chaos, and calamities!